New data released from Public Health England marks a turning point in the UK’s fight against HIV after large reductions in new HIV cases in 2016. The report Towards Elimination of HIV transmission, AIDS and HIV-related deaths in the UK, released today, shows an overall reduction in new cases of HIV by 18% compared to 2015 (6,286 in 2015 to 5,164 in 2016). This reduction is steeper amongst gay and bisexual men where diagnoses dropped 21% to 2,810 in 2016 from a high of 3,570 in 2015 – this is even more evident in London where diagnoses of gay and bisexual men dropped 29% year on year. It was noted that for the first time, the overall mortality rate of people with diagnosed HIV aged 15-59 years, who were diagnosed promptly, was comparable to that of the general population of the same age-group. It is also the first time that the UNAIDS 90-90-90 targets were achieved in in London, with 90% of Londoners living with HIV infection diagnosed, 97% of those people diagnosed receiving treatment and 97% of people receiving treatment being virally suppressed to the point where they cannot transmit the virus to sexual partners. 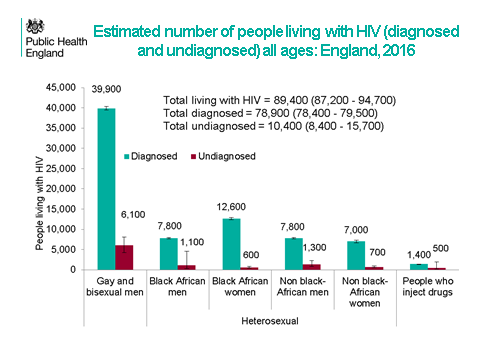 England, as a whole, are still a little way off the UNAIDS 90-90-90 figures – with diagnosis/treatment/viral suppression currently sitting a 88%, 96% and 97%. The report once again highlighted that too many people are still being diagnosed late, after the point at which they should have already started life saving treatment, especially among heterosexual men and women. People diagnosed late have a higher risk of death within the first year of diagnosis and a higher chance of serious ill-health in succeeding years. They have also spent a longer period unaware of their HIV positive status with possible risks of transmission to sexual partners. “This year, there are 3 firsts in the 30 year history of the UK HIV epidemic. In London, all the global UNAIDS 90:90:90 targets have been met with 90% of people living with HIV infection diagnosed, 97% of people diagnosed receiving treatment and 97% of those receiving treatment virally suppressed. HIV transmission among gay and bisexual men has fallen for the first time and the death rate among people with HIV who are diagnosed promptly and on treatment is now comparable to the rest of the population. “This data is very welcome and shows what can be achieved if we increase testing and get people on treatment early. But we cannot be complacent. The equivalent figures for the whole of England are 88%, 96% and 97% respectively. However the number and proportion of diagnoses made at a late stage of HIV infection remain high, particularly among heterosexual men and women. The London figures are in part thanks to a big increase in repeat HIV testing by several large Sexual Health Clinics. The picture in general practice and many hospitals around the country is very different, and routine HIV testing is still not being offered in areas of high prevalence.